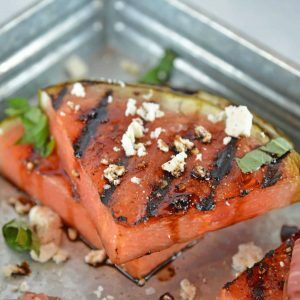 Grilled Watermelon Steaks with balsamic reduction and feta cheese are an easy BBQ side dish. Caramelized, juicy watermelon with savory cheese and sticky reduction is delicious! Baste watermelon slices with extra virgin olive oil. Preheat grill to medium-high heat, cleaning and oiling grates. Place watermelon slices on to direct heat, leaving in place to get grill marks and a good caramelization. Grill for approximately 3-4 minutes on each side. Remove from the grill and season with Maldon sea salt, freshly ground black pepper, drizzle with balsamic reduction, crumbled feta cheese and fresh basil.